In 2003 the federal government set up a list where Americans could register their phone numbers, and telemarketers could no longer call them. This was the National Do Not Call Registry, and it was fantastic. It really worked. Then sometime around 2011, it didn't. Yesterday, I got a call from Rachel at card services, someone claiming to be from Microsoft telling me my computer was in jeopardy, and a person telling me that due to my recent travel, I had earned Hilton points. The most frustrating part of this is that the caller ID on my cell phone showed a local numbers with the same exchange as mine. Last year The Federal Trade Commission received 3 million complaints about telemarketers. The FTC estimates that customers lose $350 million annually by falling for these rip-offs. Why is this happening? You can blame the same voice over Internet protocol (VoIP) technology that eliminated the long-distance surcharge. This technology revolutionized telemarketing. Companies can set up shop outside the US - outside of regulatory reach - where they blast consumers with pre-recorded auto dialed calls. They use spoofing technology to disguise the caller ID so the number looks like a legitimate call. Last year, the Federal Trade Commission gave telco carriers explicit authority to deploy solutions to combat robocalls. There are several bills in legislation that are aimed at preventing abusive telemarketing, including the "Repeated Objectionable Bothering of Consumers on Phones Act - the RoboCop Act. The future of these bills is uncertain, as the current legislative mood is more towards deregulation and the telemarketing lobby is strong. There are Apps like Nomorobo that you can purchase to block robocalls. Nomorobo was developed by Aaron Foss in an bid to win a $50,000 prize from the FTC in 2013. It is now offered by many carriers as an add on service or can be purchased. Most cloud phone systems have the ability to block specific calling numbers, but this can feel like a game of whack-a-mole as the telemarketing companies use spoofing technology to change the caller ID. Of course, you can just not ever answer the phone. 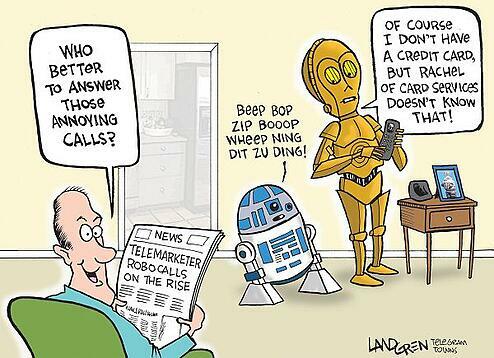 Most robocallers will not leave a message in your voice mail.